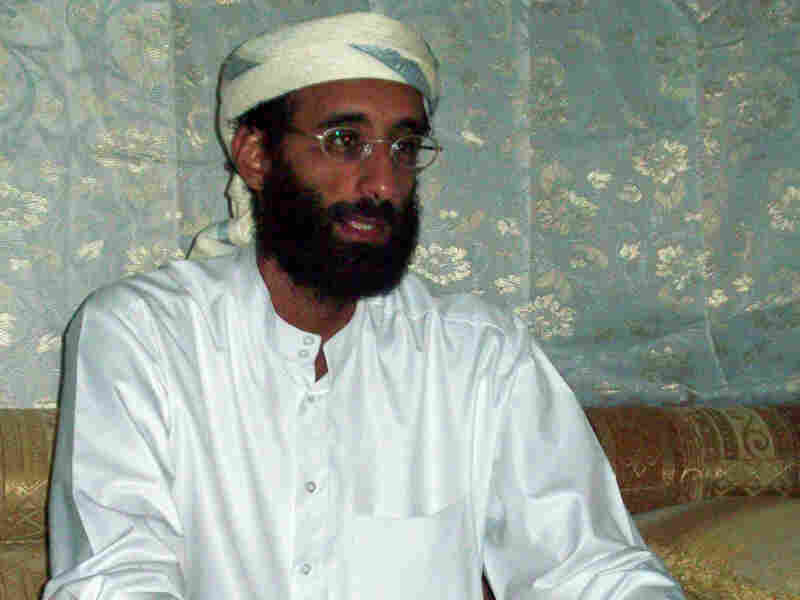 Debate Erupts Over Legality Of Awlaki's Killing Anwar al-Awlaki may have been one of the most wanted men in the world, but he hadn't been convicted of a crime in American or international courts. Civil liberties groups are arguing the Obama administration may have gone too far by killing Awlaki far away from the battlefield. "The government should not have the unreviewable authority to carry out the targeted killing of any American, anywhere, whom the president deems to be a threat to the nation," says Hina Shamsi, who leads the national security project at the American Civil Liberties Union. But the Justice Department responded that Awlaki wasn't just any American. He transformed himself from a cleric who inspired young Muslims with words to an operational leader who helped equip terrorist plotters with deadly bombs. The U.S has always seen somebody who is planning attacks against the United States as a lawful target. All those questions came roaring back again today with word of Awlaki's death at the hands of the U.S. government. "The requirements of the Constitution with respect to due process for killing an American are not clear," says John Bellinger, a lawyer in the State Department under President George W. Bush. After 10 years of talking about legal authority when it comes to terrorism, he says, there's still no international consensus on the legality of drone strikes — and no clear precedent for using those drones to kill a U.S. citizen. "Wherever they are in the world, they have a constitutional right to due process," Bellinger says. "But due process doesn't necessarily mean an adversarial judicial hearing." So, Bellinger says, under his view of the law, a criminal trial or even an indictment doesn't have to happen to satisfy the Constitution. Instead, a legal finding by the Justice Department and debate among lawyers from multiple government agencies might have satisfied Awlaki's rights under the Fifth Amendment. Ken Anderson, who teaches at American University's Washington College of Law and follows U.S. policy on drones, says the analysis starts with whether Awlaki amounted to a lawful target — U.S. citizen or not. "The U.S has always seen somebody who is planning attacks against the United States as a lawful target," Anderson says. "[The government's] standard is we're not going to be targeting somebody in London or Paris or someplace that's got the effective rule of law," Anderson says. But by hiding in Yemen, Awlaki couldn't be served with a subpoena or easily taken into custody, putting himself in a different category. The Justice Department wouldn't talk about specific operations or individuals. Nor did it want to describe the process the government used to put Awlaki on a target list. One administration official did agree to speak in general about targeting terrorists. "We're not commenting on any specific individual or operation," the official said. "As a general matter, it would be entirely lawful for the United States to target high-level leaders of enemy forces, regardless of their nationality, who are plotting to kill Americans both under the authority provided by Congress in its use of military force in the armed conflict with al-Qaida, the Taliban, and associated forces as well as established international law that recognizes our right of self-defense." Experts say that while it might not be required under the law, it would make good political sense to share more information with Congress and the public. Awlaki's case might be the first case to present these difficult questions, but it won't be the last.